When you arrive at the Santiago airport on your international flight, be prepared to wait in at least 3 lines. Please be careful of the sequence of lines as well. If this is your first time to Chile, and you are lucky enough to be a citizen of a select list of countries (Australia, Albania, and Mexico) you will need to pay the reciprocity fee upon arriving in Chile. If you skip this step and need to pay, the immigration official will send you back to pay for the fee before processing your passport and entrance to the country. Learn more about Chile’s reciprocity fee and how it applies to you. 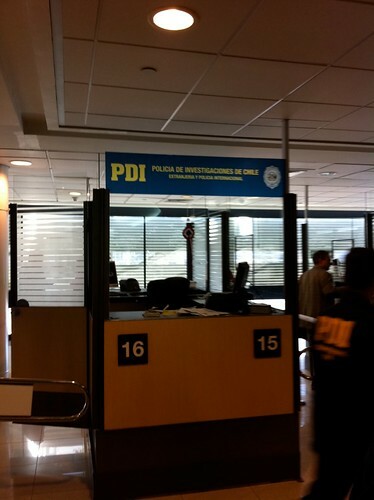 Your next step is the Policía Internacional, the division of the Policía de Investigaciones (known by the initials PDI) that checks your passport and visa paperwork when arriving in Chile. You should have received a form on your flight that the agent will stamp and put back in your passport. This tourist card will let you stay in Chile for 90 days. Don’t lose the form as they will want it back when you leave the country and some hotels may ask for it to waive Chile’s IVA tax. Be sure you get in the right line. There will be two lines: one for Chilean citizens and one for foreign nationals. You’ll likely see people jumping lines to a shorter one, thinking it is quicker. Odds are that is the Chilean line. After you get your tourist visa, proceed through the duty-free shop and pick up your luggage if you have checked bags. You’ll then have to pass through a screening by the Servicio Agrícola y Ganadero (SAG) or Agriculture and Livestock Service. They are looking for any contraband food, plants, or animals. Please be very careful about what you bring into the country and declare everything in order to avoid hefty fines. 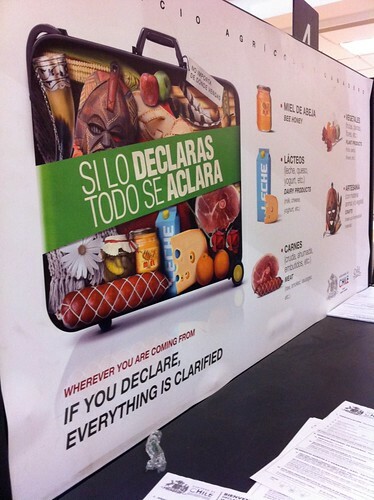 Learn more about how to avoid getting fined for what you bring into Chile. Overall, the process is pretty straightforward once you know what it is. Unfortunately, the sequence of steps isn’t very clear visually for people arriving on international flights. Keep in mind that the whole process takes a while since many international flights seem to arrive around the same time of morning in Santiago. Plan for at least an hour of waiting in lines to enter the country. The tourist visa is a scrappy bit of green paper. If you lose it (yes I’ve got the T shirt – keeping it in your passport is not the best of ideas) you will read on the web they won’t let you out of the country, you can be fined or put in prison. Don’t panic. All you have to do is go to a police station and apologise for being so ditsy and a nice police lady (in my case) makes you out another one and tells you with a smile not to do it again. @Anne – good point about the visa. The tourist visa paper isn’t attached to your passport like the reciprocity fee receipt so it is prone to fall out. Thanks for sharing your tips on how to recover it in case someone loses theirs during their stay. Hi Pepe- Love your site-it has helped me prepare for an upcoming business trip to Santiago. Please note that, as of Feb, 2014 the reciprocity fee has been rescinded for US citizens. @Brad – yes, that is correct. 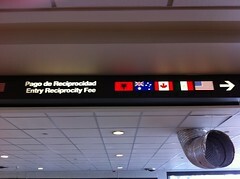 US citizens no longer need to pay the reciprocity fee. I’ve updated the article to reflect that.